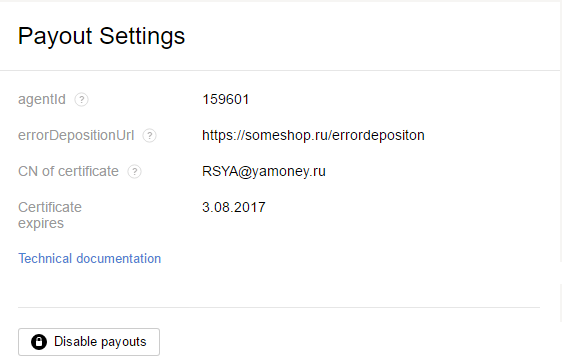 This section includes parameters for integration of your service with Yandex.Checkout. agentId—identifier of your payout gateway. We assign it upon signing up and use it for sending requests for crediting money. errorDepositionUrl—an address in your system to which notifications about return of unsuccessful payouts to a bank card, standard account, or mobile phone account. CN of Certificate—identifier of your certificate for payouts. The certificate is used for interaction with our servers. Note: if your certificate expired, payouts will seize operating. In order to prevent that, issue new certificate beforehand following the . The owner can put payouts on hold for some time. We recommend do it only in case of urgency, for instance, if you suspect a breach. If you are sure you need to do it, push Disable payouts and enter a text message password (we will send it to your phone number for passwords). You can only reactivate payouts via our manager.